The first attempt resulted in endless kernel panics which we originally put down to non-leopard compatible third party RAM. However, after growing old with Tiger and finding too many updates (e.g. 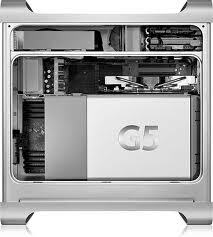 CSSEdit) would no longer work without Leopard, the plunge was taken and the G5 was fitted out with 16 GIG of Crucial 2GB 240-pin DIMM sticks. Next step, upgrade Tiger to Leopard…………………. we finally realized that one of the 4 disks in the Quad had disappeared from the desktop….. mmmnnnn….. so its the disk causing the panics? No, not in this case, to cut a long story short, the culprit turned out to be the Sonnet Tempo SATA E4i card. Or, rather, the drivers for the SATA card.